Welcome to my organic clothing review of three companies I’ve found worthy of this post. A little more than a year ago, I realized many of my clothes were made out of toxic fibers that were actually polluting the earth and potentially exposing me to carcinogens. I began looking for alternatives, which wasn’t at all easy. Everything I found seemed to be blended with synthetic fibers. I was annoyed and disheartened—where were the pure clothing companies? I found a few that I love and that I think meet the standards for ultra-pure stuff. If you’re cleaning out your closet and want to find alternatives to synthetic fibers, check out these brands. You won’t be disappointed! So which ones have the best stuff and which one did I like the most? Here’s my organic clothing review of three organic clothing companies. FYI: I did not work with any of these companies to construct this post. The information contained in this post is my honest opinion and these companies are largely unaware that I am even writing this. I do not engage in paid advertising or promotion on my site. Rawganique was one of the first clothing companies I found for this organic clothing review. I wasn’t really feeling their stuff; it looked really raw and outdated for my taste. I did end up ordering some things from them, however. Here’s what I think. Clothing: The only clothing I got from Rawganique was a pair of fleece sweatpants and some socks. Now, the fleece sweatpants were attractively priced (you’ll soon find that organic clothing is expensive) and I love them. Warm and comfortable. The socks, I hate. The fabric is soft but extremely raw, contains no elastic, and shed everywhere. They were also expensive and I will not be ordering them again. A picture of those strange socks from Rawganique. I mostly wear them to bed now or around the house. Bedding: I ordered a couple pillows and an organic comforter from Rawganique, both of which I really like. Conclusion: If you’re looking for the purest of the pure, Rawganique is your store. They are virtually the only company I could find online that makes socks and underwear without elastic in the fabric. I also plan on ordering another pair of sweatpants from them! Their prices are on the high side although their shipping costs are reasonable. Their customer service was extremely prompt, which was great. I was also able to find PACT Organic online for this organic clothing review. Their selection is pretty minimalistic, but they have all the basics. Here’s the deal. 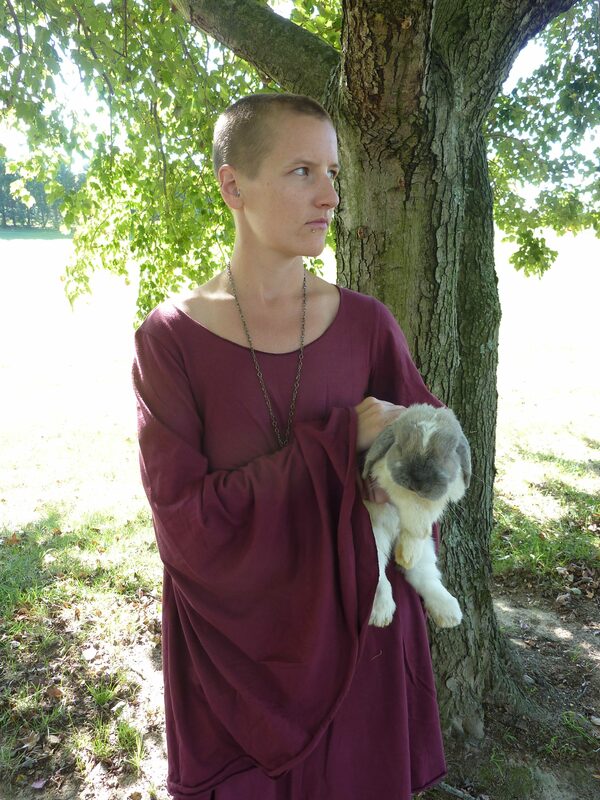 Clothing: I bought a couple long-sleeved shirts from PACT that I adore. They are simple, basic, and go with everything. I also bought a pair of sweatpants from them, which aren’t as thick and warm as the ones from Rawganique, but they are still 100% organic cotton and they’re really comfortable and less than half the price. I usually wear PACT as a base layer, you can see a black t-shirt here under my Gaia shirt. I’ve gotten some free socks from PACT as well, and although they’re blended with synthetic fibers, they fit way better and are much cuter than the ones from Rawganique. They’re cheaper, too! 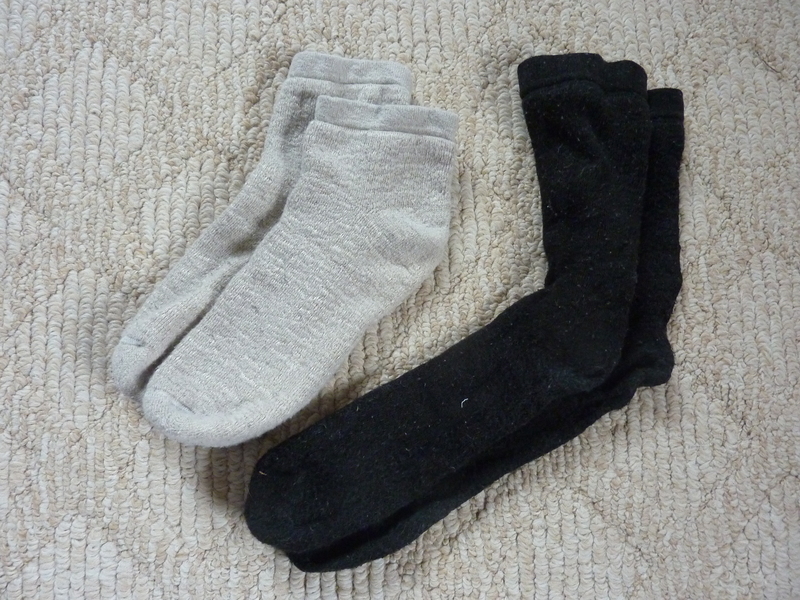 Bonus for PACT: some things you buy come with a slip so you can go online and get free socks. It’s really easy and their socks rock! Conclusion: PACT Organic uses synthetic fibers in a lot of their clothing. Their socks, underwear, sports bras, and even some of their shirts and pants use polyester or elastane. I don’t like this about PACT. What I do like is that their stuff is very cheap compared to some organic clothing, and their basics are absolutely worth the price. Their shipping is fast and free, and their returns are super simple and also free. Update: I recently ordered some more stuff from PACT and felt like their quality had diminished somewhat. I guess the old saying goes–you get what you pay for! Their clothing was much more of my style than Rawganique was and their selection was way better than PACT Organic. It’s much more expensive, however. Gaia Conceptions features handmade, eco-friendly clothing. Their pieces are truly works of art and their fabrics are to die for! The majority of their clothing is synthetic-fiber free, but you can choose to get stretchy fabrics from them if you like. Clothing: Gaia Conceptions’ clothing is second to none. The eco-friendly dyes, the colors, the cuts, the design, it’s all stunning. From summer essentials to winter warmers, Gaia Conceptions has just about anything you can think of. I’ve gotten so many pieces from here and have a few favorites. The Gypsy Petal Back Long Dress from Gaia Conceptions in 100% organic cotton knit. Color: squash. The downside to Gaia Conceptions is that since they offer natural plant dyes in addition to their selection of low-impact dyes, the plant dyes come out all different colors. They show the colors on the models on their site, but that may not be at all the color you end up with. This is true for all of their plant dyes including brazilwood, sage, sunshine, poppy, and indigo. I think Gaia could do a better job of letting its customers know that these plant dyes vary hugely, however, they do disclose on their site that all dyes are subject to variation, even the low-impact ones that aren’t considered pure plant dyes. The Priestess Sleeve Ballerina Wanderer Short Dress in 100% organic cotton knit. Color: raisin. The other bad thing about this is that once you have a piece, you’re stuck with it. It doesn’t matter if the piece is damaged, incorrect, etc. It’s yours. Gaia makes you pay for return shipping for them to correct or replace the product, and they will absolutely not take a piece back just because you don’t like it. This is conscious consumerism right here. Gaia’s customer service is prompt although again, their return policy should absolutely be noted before purchasing anything. These clothes take up to a month to make and ship and they’re expensive, so you want to be absolutely sure that you’re getting what you want and are willing to accept imperfection if you choose to go with a natural plant dye. Conclusion: Although expensive, Gaia Conceptions’ handmade clothing is well-made, locally based in North Carolina, and truly unique. You will not find free shipping here and while they include free gifts with each order, you will rarely find discounts. Around the holidays and equinoxes they will typically have 10% off your order. I’m surprised to say that this clothing is somehow worth every penny. I had no idea what I was getting into when I was searching for organic clothing for this organic clothing review. Here’s what you should know if you’re considering making the switch. It’s more expensive. You’ll pay much more for organic, natural fibers than you will for non-organic, synthetic ones. Fabrics that are blended with synthetics are cheaper. Anything you find on an organic clothing website that’s been blended with elastane, spandex, or polyester is cheaper than the pure stuff. Many people like their leggings, underwear, and socks to have a bit of fit to them. Some pieces are unique. If you get pieces that are handmade—which some organic pieces are—you should expect variations in the color and cut. You can contact the company if you have any questions before purchasing! It’s a different buying experience. Don’t expect to buy organic clothing and get the same experience as you do at Forever 21. This is not that. These clothes are harder to find while you’re out. They don’t look or feel the same as synthetic fibers. The customer service is different. You will feel different wearing them. They are much more expensive. You will need to take better care of them. Get some freaking plant-based detergent. I use Dr. Bronner’s for everything, but if you don’t, you should really invest in some plant-based detergent for your new organic clothing. Plus don’t you know all the big-name brands test on animals? You can utilize thrift stores. If you can’t afford to pay for new organic clothing, why not check out some used stuff? Even if it’s not organic, 100% natural fibers such as hemp and cotton are the next best thing. Your local thrift store may have some options! Have you ever tried to shop for organic clothing? Making the switch is an investment. It can feel painful to pay $90 for a t-shirt when you could buy one on clearance at a department store for $5. When you think about your impact on the world, it doesn’t feel like that much money, though. Plus, you’re much thriftier with your cash when you buy natural fibers because they’re so much more expensive. I now have a semi-minimalistic closet with just a few essentials and all my favorite organic fabrics in there. It was difficult finding the right companies for this organic clothing review, but it felt so worth it to get rid of all my toxic clothing and invest in a few pieces that truly inspire me!